A couple weeks ago I attended a dinner party at a friends house. The meal was made from meat, vegetables and fruit that the hosts had raised and grown right there on their own land. It was served family style around a huge table that comfortably fit the 15 who attended. The food was absolutely delicious. Of all the tasty items that were prepared, one stood out – the sweet corn. The flavor was succulent and seemed to burst forth with each bite. I couldn’t control myself and ended up eating three huge servings. After the dinner I complimented my friend on the great meal and excellent corn. His Dad had been growing that particular variety, Illini Xtra Sweet, since he was a kid. They usually stagger two or three plantings a couple weeks apart so they have corn to pick fresh for dinner for a long stretch during the summer. 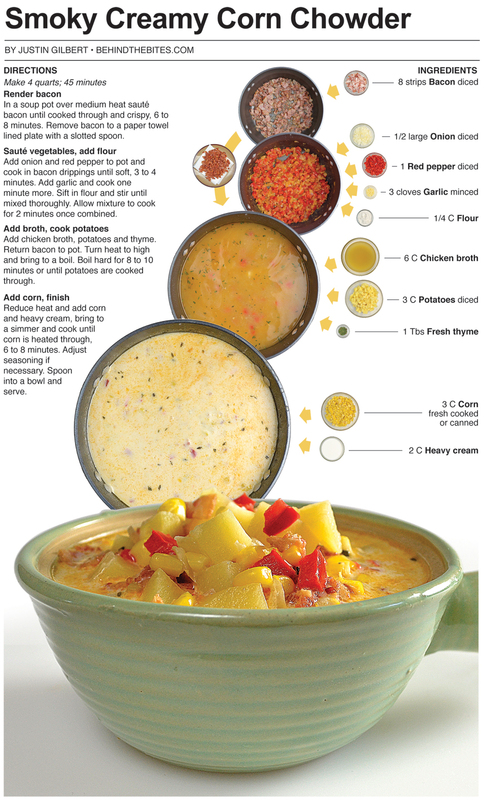 He gave me a few ears as a parting gift and I used it in this smoky corn chowder. 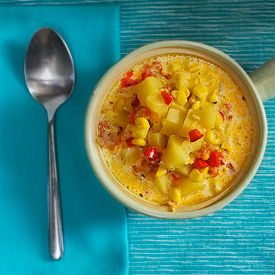 It’s a tasty soup, but this variety of corn is off the hook all on its own. The entire meal at my friends house was a step back into the past. The last time I had eaten a family-style meal of made-from-scratch, farm-raised ingredients was at my great grand parents more than 30 years ago. My great grandmother was a home maker and great grandfather a farmer. They raised and grew all of their own food and were able to provide for seven healthy children. That sort of life-style seemed to have disappeared with the rise of Walmarts and superstores of the modern day. It was refreshing to have dinner at my friends house with a large group of comrades in this old-fashion style. The hosts really appreciated the farmed-raised and fresh grown aspects of a good meal, it was evident by the preparation. There were no fancy spice rubs or compound butters, just fresh food prepared perfectly. A humble meal free from pretense and full of great flavor. This is how the Great Spirit intended for us to eat. 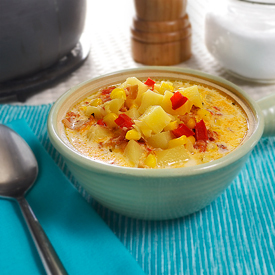 In a soup pot over medium heat sauté bacon until cooked through and crispy, 6 to 8 minutes. Remove bacon to a paper towel lined plate with a slotted spoon. Add onion and red pepper to pot and cook in bacon drippings until soft, 3 to 4 minutes. Add garlic and cook one minute more. Sift in flour and stir until mixed thoroughly. Allow mixture to cook for 2 minutes once combined. Add chicken broth, potatoes and thyme. Return bacon to pot. Turn heat to high and bring to a boil. Boil hard for 8 to 10 minutes or until potatoes are cooked through. 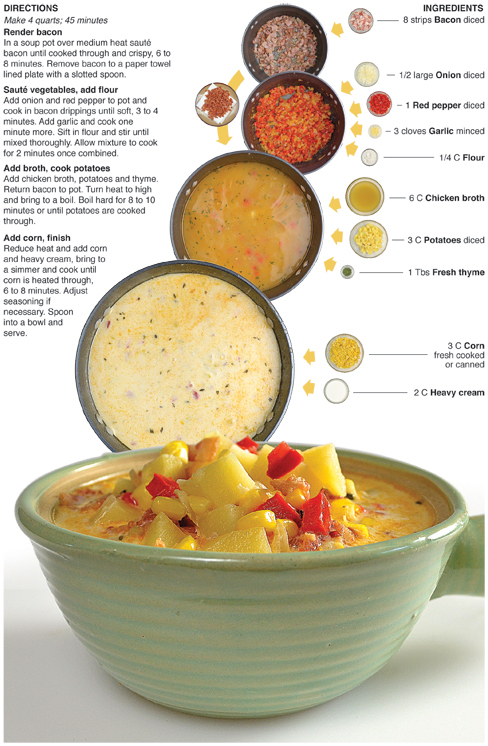 Reduce heat and add corn and heavy cream, bring to a simmer and cook until corn is heated through, 6 to 8 minutes. Adjust seasoning if necessary. Spoon into a bowl and serve.